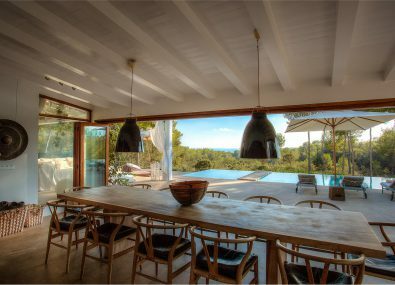 Can Jondal is a beautifully refurbished exclusive Ibiza villa rental. 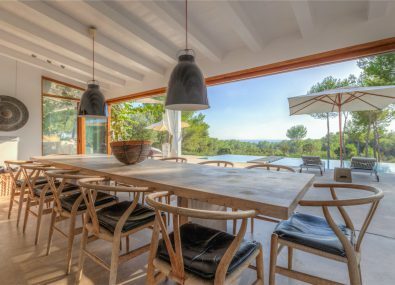 Located in the rolling forest just a short distance from the exclusive Cala Jondal beach. 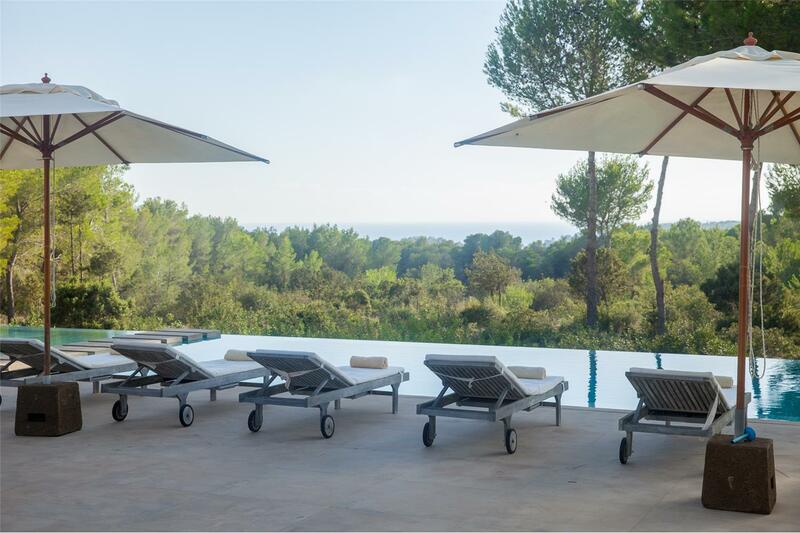 The villa is approximately one kilometre from the main road making it very secluded, private and quiet. The approach is ‘guarded’ by several spiritual stone formations, which lead to the villa’s imposing electric hardwood gate. A feature which greatly increases the security of the property. This inviting entrance opens up into a large courtyard, with a central water feature. 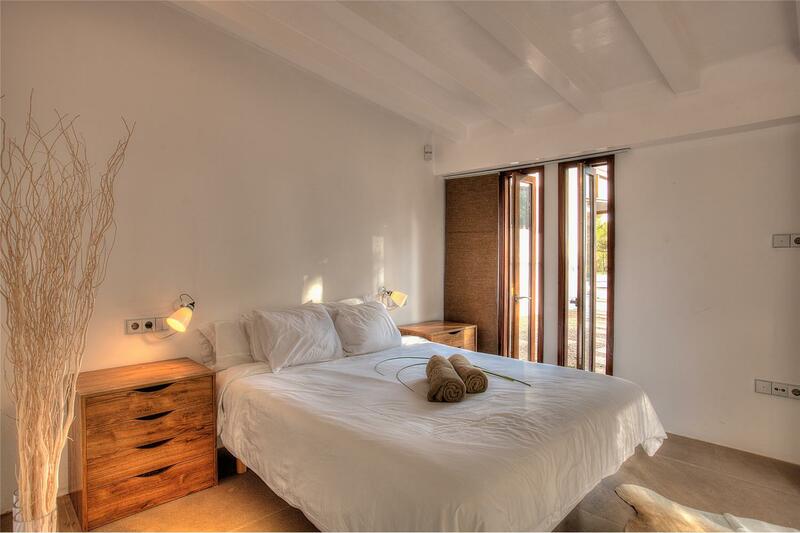 Immediately you can see you are entering a very stylish combination of minimalism and luxury. 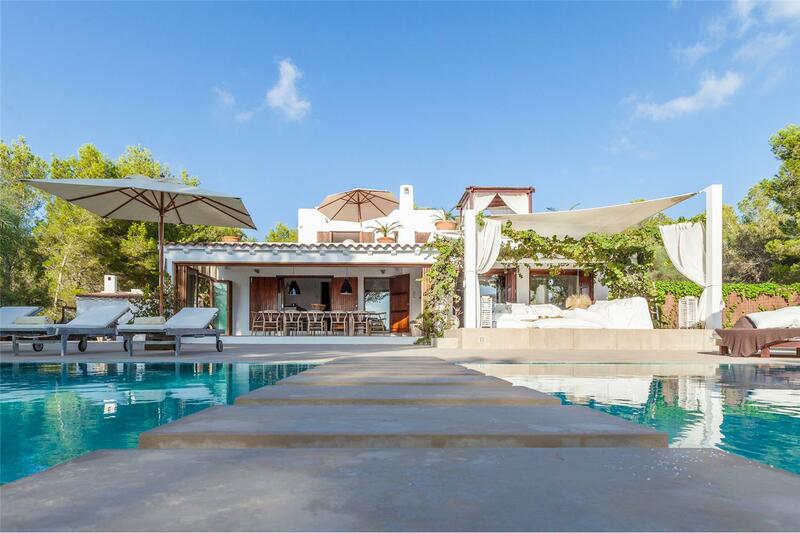 The villa comprises of three buildings surrounding an inner garden and second water feature, as well as an outdoor kitchen and dining area. The main house is on two floors. 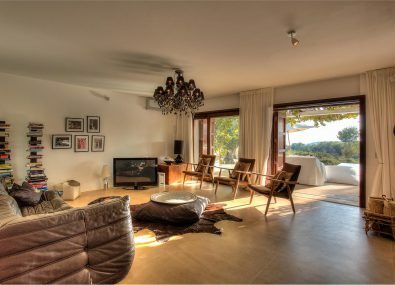 At ground level, there’s a large open plan living area, as well as two bedrooms, a bathroom (with bath and shower), a small indoor kitchen and utility area. 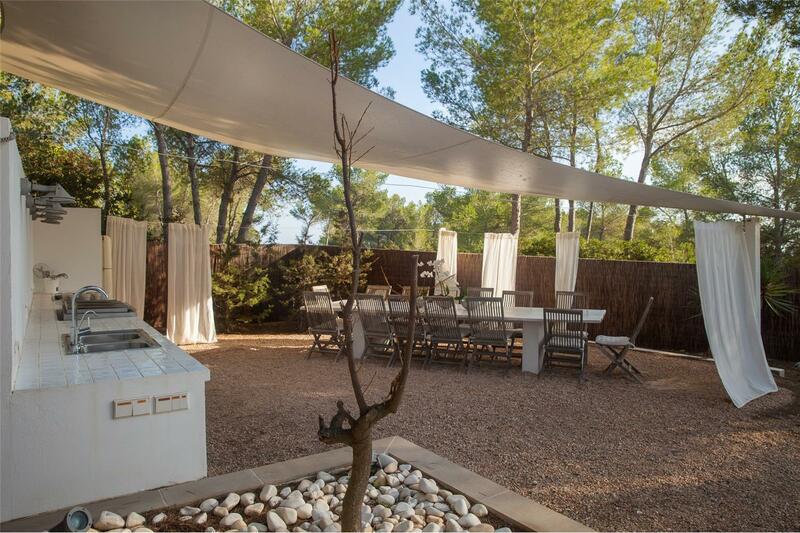 From here, there is sliding glass door access to a covered porch/conservatory with dining for 12 people. 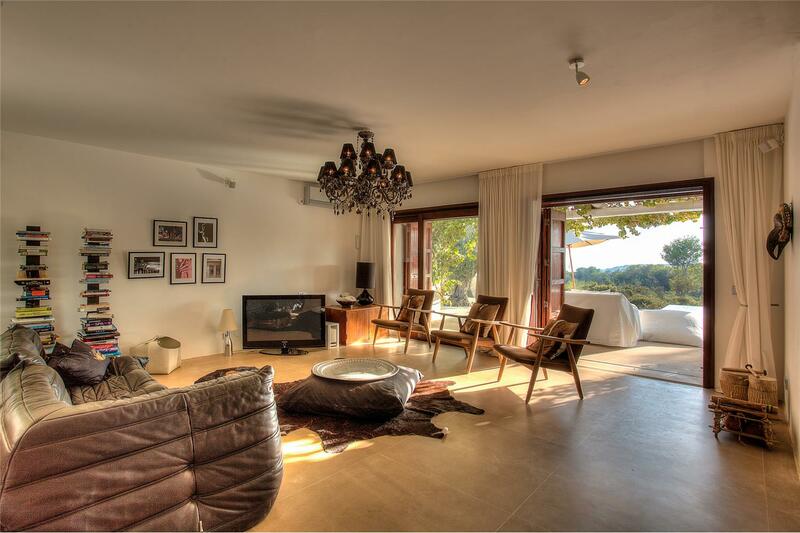 This area has sliding glass doors which can be fully open during the summer months or closed during the winter. 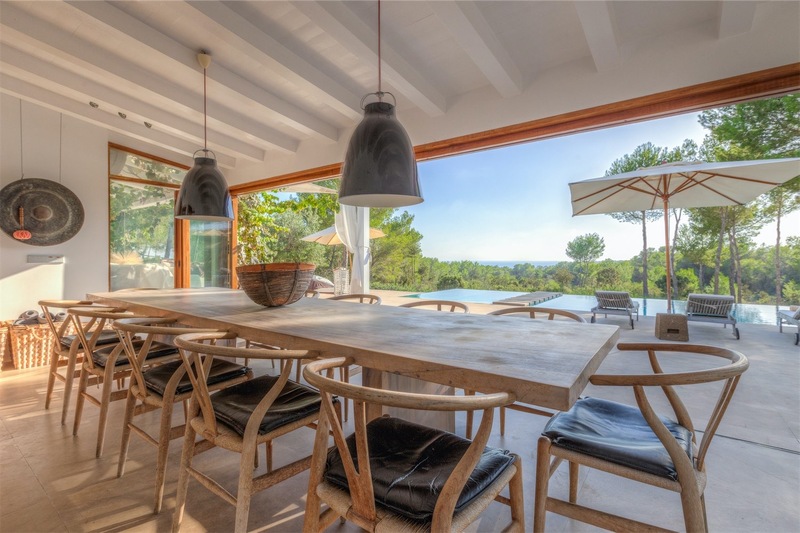 This space also has air-conditioning or, out of season, solar generated underfloor heating. 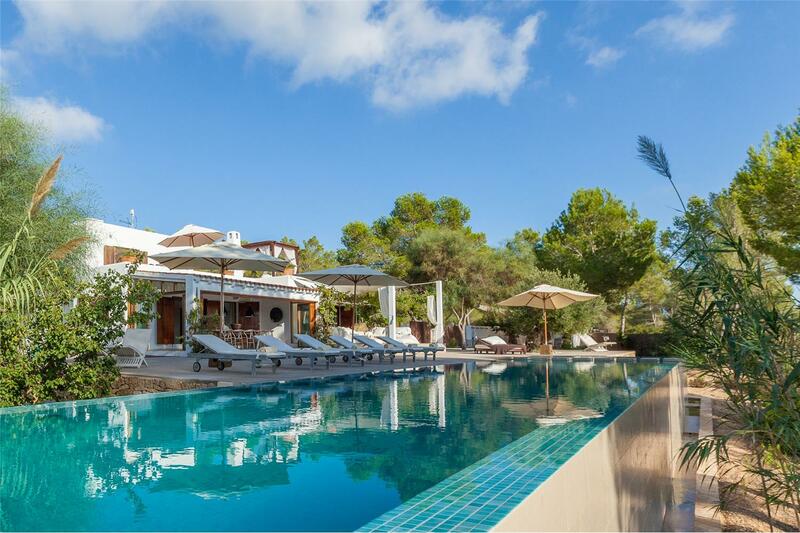 This exclusive Ibiza villa rental is fully alarmed throughout. 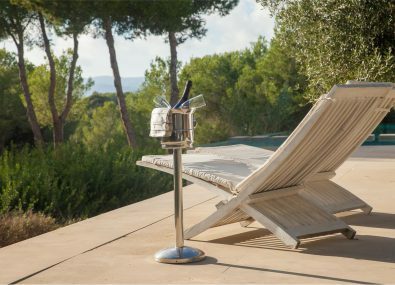 The villa itself boasts the latest Bang & Olufsen ‘zonal’ surround sound system, which can be adjusted into various areas around the property (living room, dining area, outdoor seating, etc) and which can be operated directly from a number of devices, including phones and laptops. For entertainment there is a HD TV with Apple TV, DVD and an X-Box. 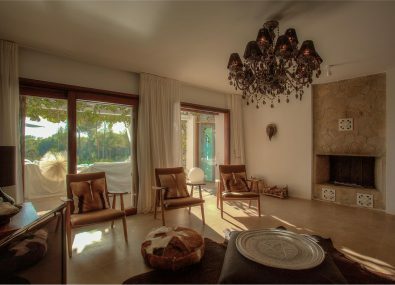 The living area, with its own fireplace, is an Asian-Scandinavian fusion with some original retro furniture, completely restored. 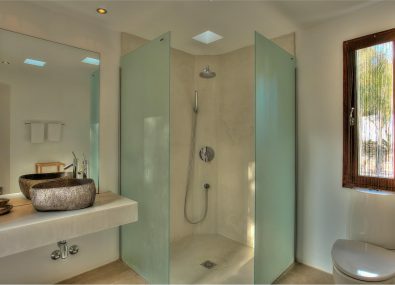 A unique feature is the tranquil sound of running water which can be heard from each of the six bedrooms. 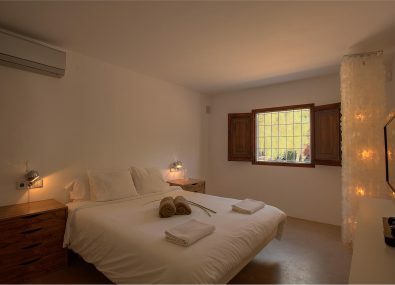 The first and second bedrooms, on the ground floor of the main house, both have double beds. The first also having a digital TV. 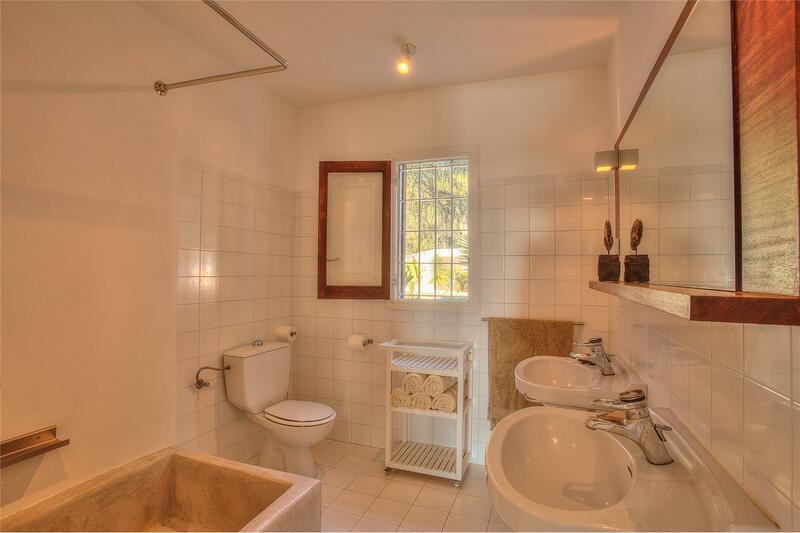 The shared bathroom has a bath and a shower, as well as two wash basins. 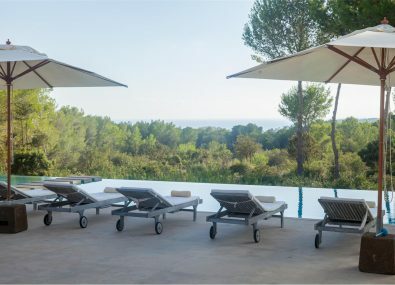 The master bedroom above, opens out onto its own roof terrace with lovely views of the forest and sea, as well as a day bed, sun loungers and dining table for four. 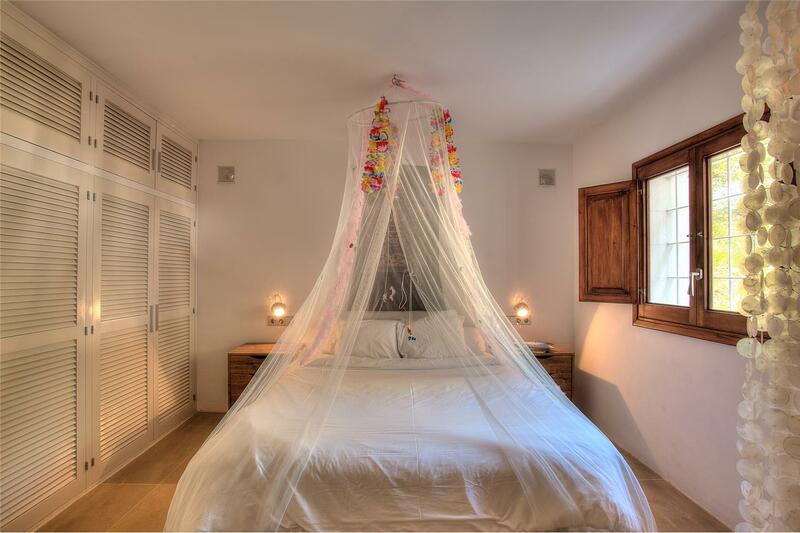 The bed is a large double and there is also an en-suite shower room. 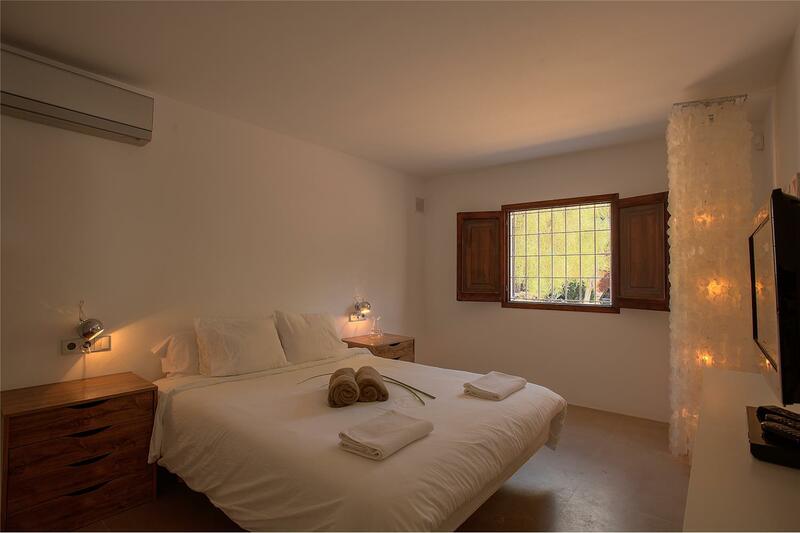 The inner garden has a path leading to a separate building with two bedrooms and two bathrooms. This has its own covered, comfortable, seating area. 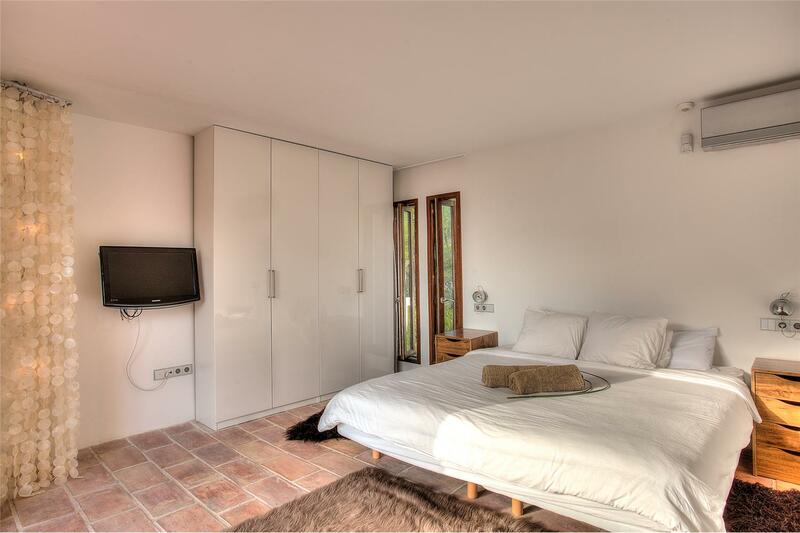 Both bedrooms lead out onto this space through large glass doors. 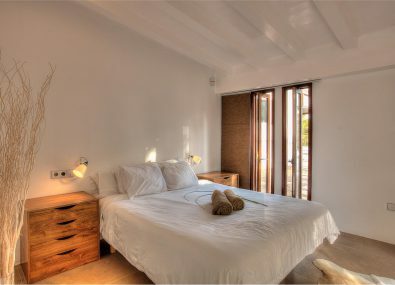 The first of the two rooms has a large double bed, whilst the second has two singles. 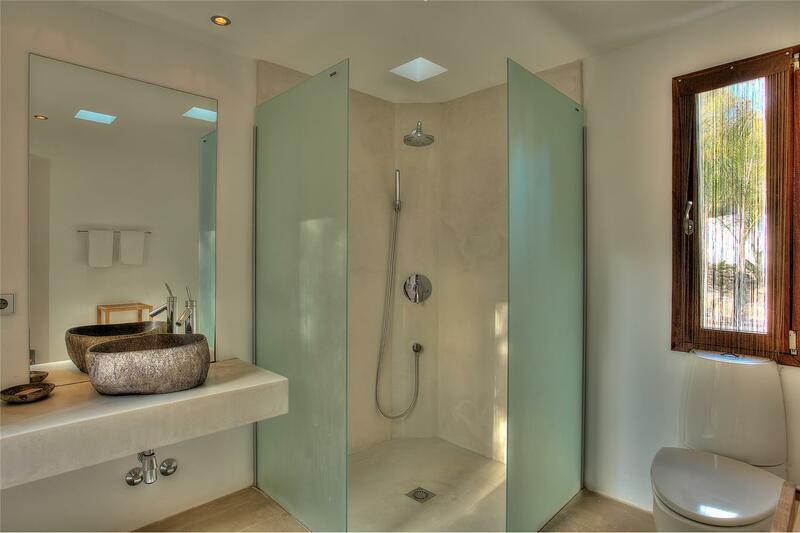 Both have their own en-suite shower rooms. 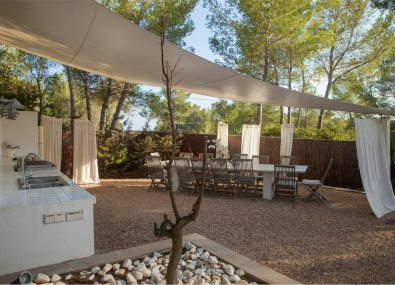 The smaller of the separate buildings has its own decked terrace, with outdoor shower, looking directly into the forest. 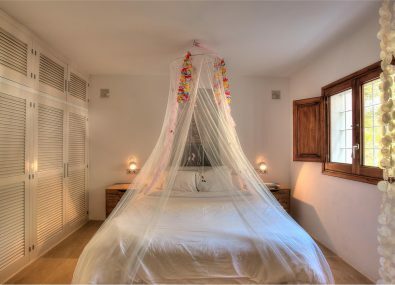 A few meters away, nestled in the forest, is a double ‘four poster’ day bed. 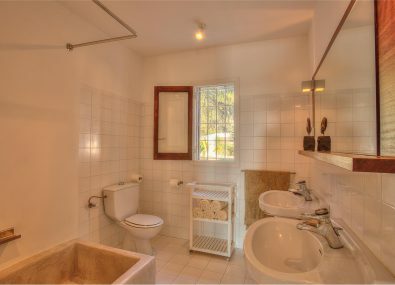 Again, there’s a large double bed with en-suite shower room. 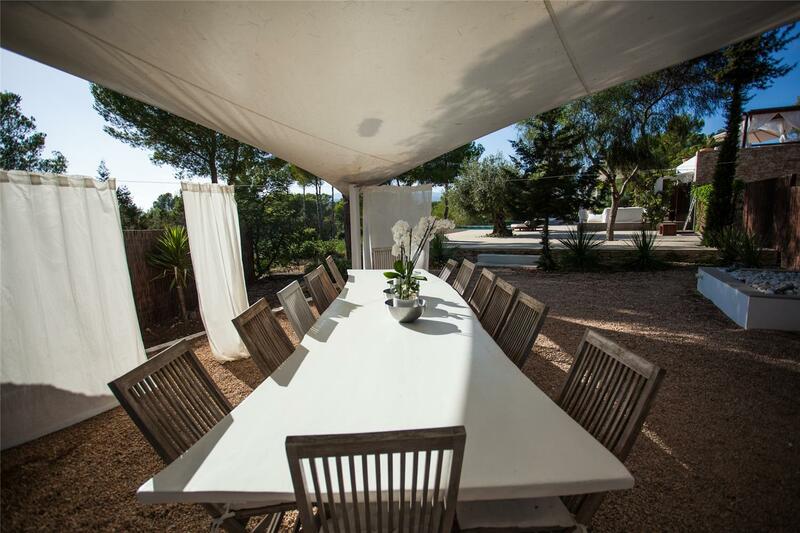 The larger, outdoor, kitchen has all the necessary equipment, including high-end cooker, BBQ and table for 14 people. 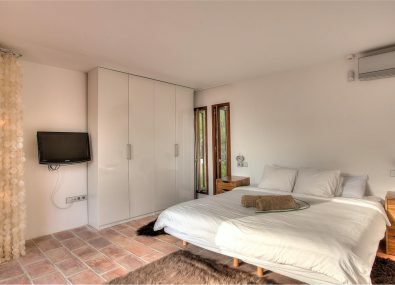 The kitchen has all modern appliances including a SMEG fridge freezer, oven and dishwasher. The smaller kitchen in the main house has its own water supply which is fed by a well and then filtered. There are three large fridges including one specifically for wine. 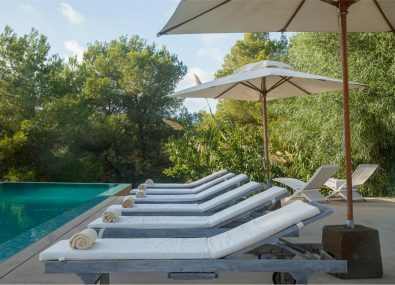 At the front of the villa is a large limestone terrace with sun loungers and a comfortable seating area covered with a trailing vine. 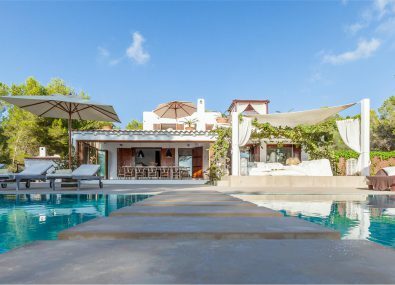 The large, ‘state of the art’, UV maintained, salt water swimming pool (24m x 4m) has a fabulous underwater sound system and ‘mood change’ lighting. 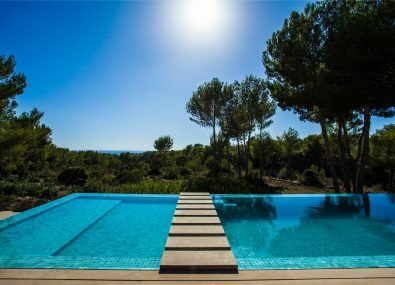 It is also possible to heat the pool in early and late season. The separate children’s section of the pool can also be used as a ‘hot pool’. 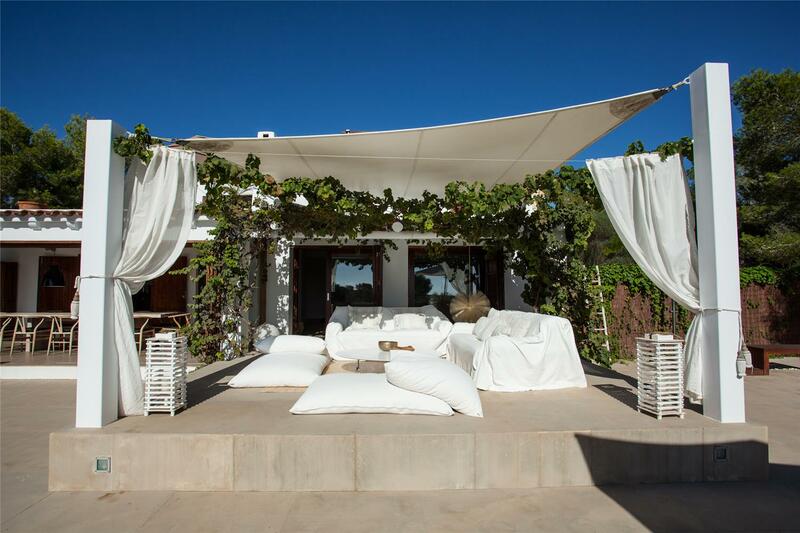 Perfect for relaxing with friends or for various water spa treatments. For child safety it is possible to fence off the swimming pool for peace of mind. 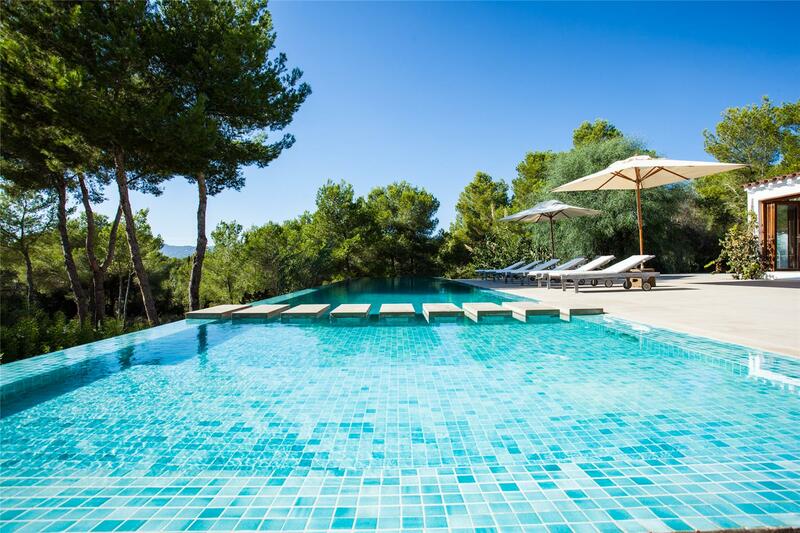 From the swimming pool you get wonderful, enchanting, views of the forest all the way down to the sea at Cala Jondal. 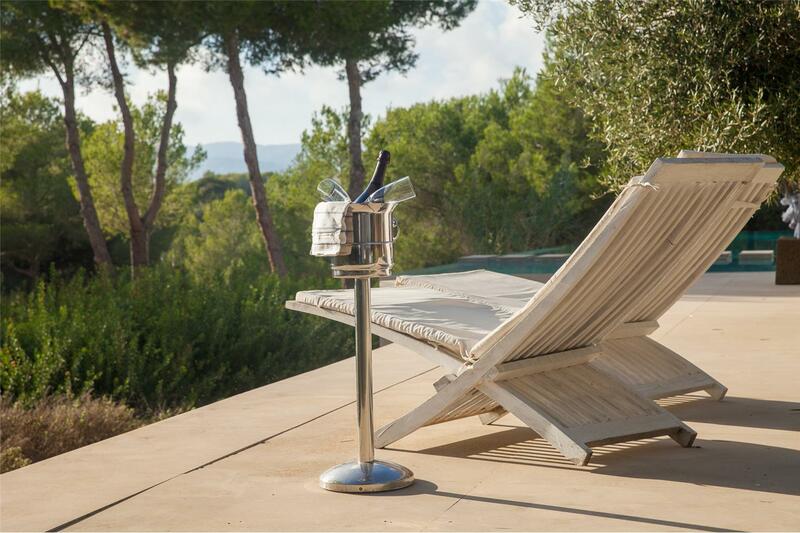 What’s perhaps most striking is the peace and tranquillity of the villa’s setting. 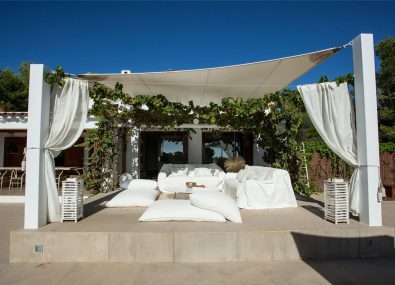 Yoga mats and massage beds are provided for use on the terrace or the various beautiful Yoga platforms. 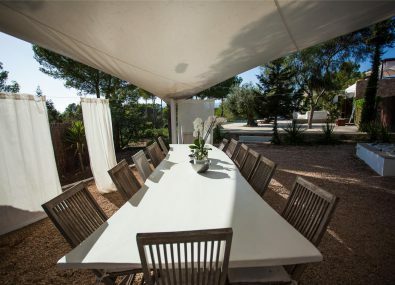 There is a live-in housekeeper (she stays in a separate building on the property) who provides daily housekeeping six days a week and is on-hand to help prepare breakfast and sunset drinks for you if you wish. 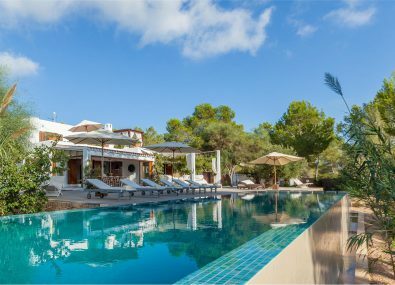 Carefully hand-picked, all our villas are equipped with swimming pools, we also have a private selection of high end luxury villas. For something extra special please email us for options. 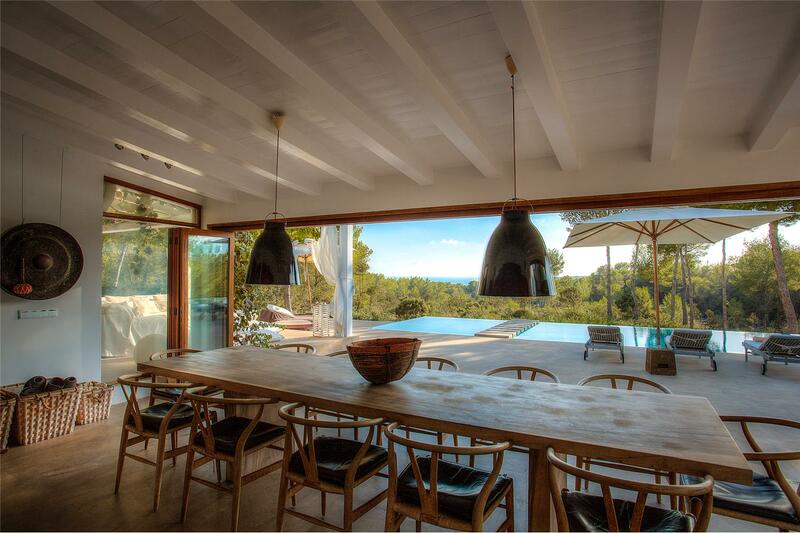 Ibiza Villas Direct and all villas we represent are registered with the Tourism Board in Ibiza. You can be ensured that quality villas and quality service is what we offer.